First, realize that you are not alone and you have not lost your mind. Millions and millions of people from all over the world and from ancient times up through this very moment have had similar experiences. Thousands of people in the last 24 hours alone have had an NDE. An NDE is an extraordinary experience, but it happens to ordinary people, and it happens frequently. You may want to tell the world about your NDE, or you may want to think about it, possibly for a long time, before trying to say anything. You will probably feel frustrated trying to find words to describe it, and fearful that no one else will understand. But there are many resources available to you. This page lists a number of them. If your experience was distressing, we have specialized information for you. And/or, if you had your experience as a child, we have other specialized information. Many experiencers find that PMH Atwater's books help them. If you prefer audio, there are many tapes available from IANDS conferences. Research has shown a number of common after-effects in the experiencer. We have a letter from medical professionals (PDF) (If you have trouble reading the PDF file, the Adobe Acrobat Reader is available for free download.) that you can print out and show to your health-care providers, if you choose. If so, IANDS also suggests that you print the Lancet article to show to your doctor. IANDS would like to know about your experience. Please consider telling us about it. When you first decide to talk about the experience, choose a person who is a good listener, someone with whom you are comfortable. We have a page that has suggestions for finding someone to listen and help you make sense of your experience. If you wish to use a therapist, we have guidelines for choosing a therapist. If you want to talk with another experiencer or to someone who will not need too many explanations, look first for a support group near you. If there isn't one, contact the IANDS office for the name of someone reliable. Or, you can post to one of the message boards that are available on the web, including an e-mail support group. Perhaps you will find that your old life-style doesn't seem right any more. You may be surprised at how many people in your community already feel the same way; and that there are resources available locally for you. As mentioned above, through IANDS, some communities have support groups of near-death experiencers who are able to be both supportive and well informed. At the least, many experiencers find that some 12-step groups (which are in a great many places) have a similar outlook. There are such groups even for people who don't have a chemical dependency. Consider joining IANDS. We have various publications available to keep you informed and in touch with other experiencers, and a conference that can bring you in contact with many experiencers at the same time. And, we need your support so that we can continue to spread the word to other experiencers as well as care-givers and researchers. In any event, IANDS would like to know about your experience. Research has shown no difference in NDEs based on the sexual orientation of the experiencer. 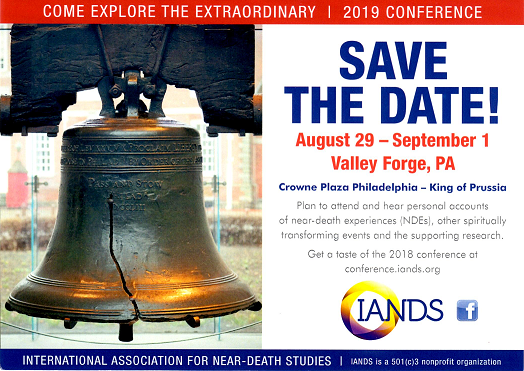 IANDS conference presenters have reported research findings that the NDEs of gay/lesbian people and those of heterosexually oriented people were indistinguishable. Here's one link and another.